In this last part of the twentieth century we find ourselves at an extraordinary historical time in which, as a result of a rapidly growing global economy, we can purchase nearly any good, from anywhere in the world, at any time or any place. However, the advantages of this carry a cost-we no longer know the story of those goods. The complex global system of exchange separates us from the story of their production-a story that relates the human beings who made them to the minerals, rivers, plants, and animals that gave of their substance to form them. Without these stories we tend to think of our economic transactions in abstract terms. We talk of earning 6% interest, but have no picture of what our money is doing tonight-whether it is building wheelbarrows in Brazil; growing corn on chemically fertilized land in Iowa; producing chlorine-bleached paper from North Carolina wood chips; or making shoes in a crowded, toxic-polluted factory in Thailand. The lack of direct knowledge of the consequences of our economic choices, removes us from a sense of responsibility for those consequences. 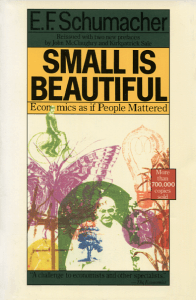 Small Is Beautiful, published in 1973, first brought to popular attention the link between our economic policies and the degradation of the environment. Though Schumacher was most often associated with appropriate technology, his genius lay in his vision of a place-based economic life. He defined healthy economies as diverse, independent, regional economies producing locally for local consumption. In such vibrant local economies, we would again see clearly how, by whom, and under what conditions items were produced. We would then make the link between a healthy environment and healthy people. It would be easier to organize support for economic policies that included protection of the unique and fragile ecology of a region. Such an economic revolution resulting in strong independent regional manufacturing and trade associations and in regional control of land and natural resources would be an environmental revolution as well, reinstituting a love and commitment to the landscape of an area and to its unique resources and carrying capacities. In face of a deepening environmental crisis, Schumacher’s voice continues to resonate through new generations. There are now new allies in the work to form a responsible way of living on and with the planet. One of the most influential of these is Wendell Berry. A writer by profession, he returned to Henry County, Kentucky to farm the land that his grandfather once farmed and raise his family where he himself was raised. His essays, stories, and poetry reflect his everyday experiences with friends and neighbors in Henry County as they strive to make their homes and farms and communities better places to live and work. It is not always such a simple task. His experiences have taught him that, “The real work of planet-saving will be small, humble, and humbling, and (insofar as it involves love) pleasing and rewarding.” As citizen groups in small towns and rural areas across the United States labor to strengthen and build their own communities, they have an increasing need for well organized and easily accessible stories of the successful application of the small is beautiful philosophy. It is to record and share that tradition that the Schumacher Center Library was formed. 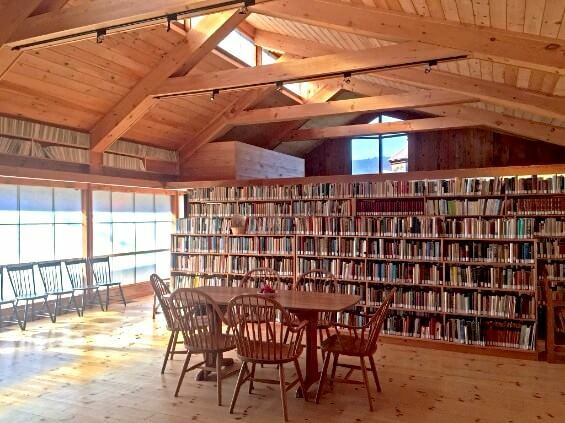 The library and offices of the Schumacher Center are housed in a 4,000 square foot wood-framed building located on community land trust land in the southern Berkshire region of Massachusetts. The upper 2,000 square feet are renovated to provide office space, library stacks, reading rooms, and a large meeting room. The Board of Directors of the Center is undertaking a $200,000 capital campaign to complete payment of the mortgage on the building, renovate the lower 2,000 square feet to provide archival storage area for the books and papers, and begin an endowment for future upkeep. 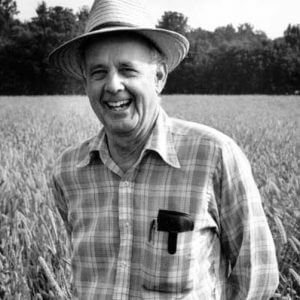 On August 6th Wendell Berry will do a benefit reading from his unpublished novel at 7:30 at the First Congregational Church on Main Street in Great Barrington, Massachusetts. The Schumacher Center is pleased to join with The Orion Society, The Nature Conservancy, the Sheffield Land Trust, Bo’s Studio, the Great Barrington Land Conservancy, the Community Land Trust in the Southern Berkshires, and the Berkshire-Litchfield Environmental Council in welcoming Wendell and Tanya Berry to the Berkshires. Please take this opportunity to renew your membership in the Schumacher Center and to join Mr. Berry in making a generous tax-deductible contribution to the library building fund.